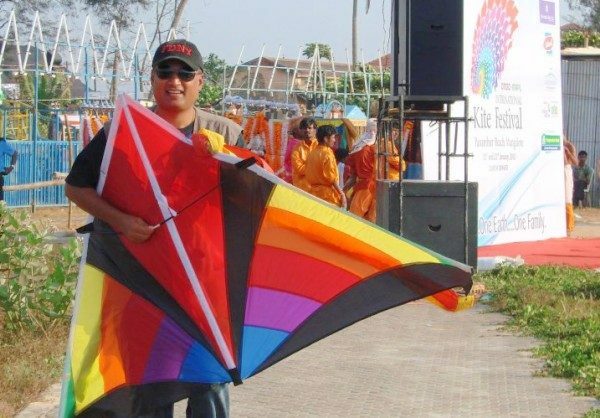 Our very own Belagavi kiteman, Sandesh Kaddi, an International Kite flyer and kite maker would be participating and exhibiting Indian Art kites and its literature at the upcoming fest at The 6th TAFISA World Sport for all Games Jakarta, Indonesia, which will be held from Oct 6 to Oct 12 of 2016. He will be representing India in this Indonesian Kite Festival. Sandesh has been making, teaching and flying kites over years and has participated in various international kite fests all over the world. The hobby has been passed on from his father, and following the same tradition Sandesh taught his son, and his wife to fly kites. It’s been ten years for Geeta and Sandesh’s marriage, and since then Geeta has admired and respected her husband’s hobby- kite flying. We wish him happy flying and may his kites bring him all the success and good luck. Great achievement in rare creativity talent. We are sure your crafts will be much appreciated. Good luck and wonderful time there.